The combination of heat and moisture causes denim to shrink when laundered in a washing machine and dryer, but if your jeans are already clean, you can still use moisture and heat to shrink them. 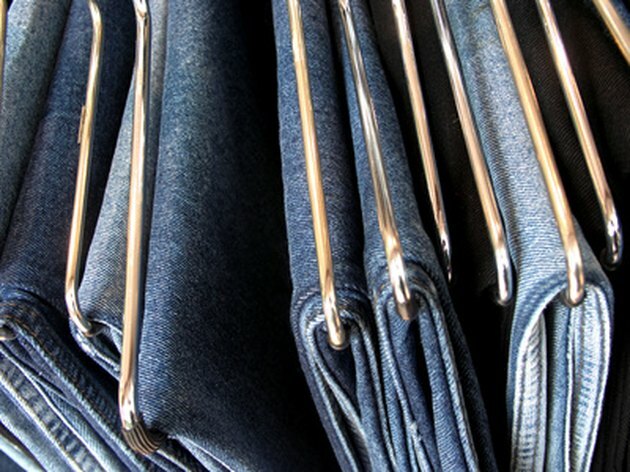 Instead of wasting energy to wash clean stretch jeans to shrink them, administer steam heat. The cotton setting on your iron is normally used for shrinking denim, but check the ironing directions on your jeans label before setting your iron. Stretch denim sometimes has a small percentage of Lycra, which can melt at high temperatures. Turn your iron to the appropriate setting. Mist the lower leg section of your jeans to the knee area, working on one leg at a time and misting both the top and bottom layer of fabric. The fabric should feel wet to the touch, but should not be wet enough to drip. Spread the moist fabric flat on your ironing board. Press the fabric on one leg slowly, letting the steam roll out, but keep moving the iron in a smooth motion. Keep ironing until the fabric is dry. Repeat this on the other leg. Mist the thigh section of your jeans, and iron the same way you did the calve area, letting the denim get hot enough to steam. Place a tailor's ham inside of your jeans to round out the seat and hip area. Mist the fabric with the spray bottle, and iron the fabric while it is wrapped over the ham. Leaving a hot iron in one spot too long will burn the denim.